Spearfish Area Historical Society: Anderson Homestead tour caps another great season! Anderson Homestead tour caps another great season! 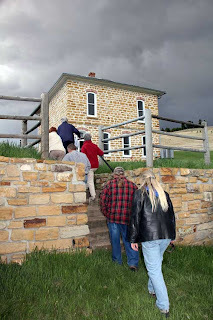 About 60 people braved threatening skies Tuesday evening (5/1/12) to enjoy a tour of one of the most historic ranch sites in the northern Black Hills -- the James Anderson Homestead just northwest of Whitewood. The historic ranch is an alluring and familiar site to area residents that trek up and down I-90 between Spearfish and Sturgis. Hank Frawley hosted the group of Spearfish Area Historical Society members, giving them a first hand look at the barn, springhouse, and restored home that was occupied by his great grandparents, James and Catherine Anderson, more than a century ago. James Anderson developed a lucrative dairy business, capitalizing upon reliably constant 40-degree spring water to cool his products before hauling them to Deadwood for sale. It was an enterprise that resulted in construction of several sandstone buildings that were a showpiece in their day -- and which have been restored to update the buildings with plumbing and electricity, while preserving the original exterior and the ambience of 19th century architecture in the Black Hills. "It's a wonderful story about Danish immigrants who came to this country with probably nothing but the clothes on their backs, came here to homestead, and made good," said Frawley, who lives just down the road in another historic structure known as the "Frawley Middle Ranch." After a short examination of the Anderson barn, which still has much restoration to be done, the group hiked across the barnyard to a key location for the operation: the springhouse. It's where the spring water was captured and channeled through a storage area before flowing to a stock tank adjacent to the building. The jewel in the crown of the Anderson Homestead is the two-story home that sits above the springhouse, bunkhouse and barn. With two-foot thick walls and a beautiful bay window on the front of the home, it is not a particularly large structure, but it was the center of life for the Andersons and their dairy operations. The structure is replete with quality period woodwork, lighting and plumbing fixtures that hearken to an earlier era, and beautifully restored windows and floors. "The Anderson's had no electricity or water in the house," said Frawley. "Basically, we gutted the interior in order to accommodate needed modernization, but we made every effort to preserve the overall historical appearance of the structure and retain an early 20th century feel." 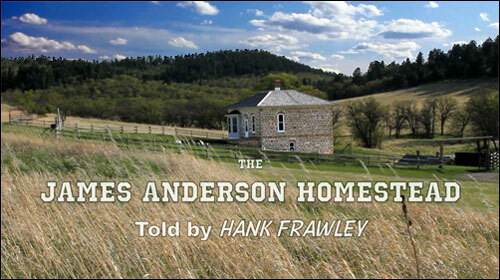 Also known as the "Frawley East Ranch," the James Anderson Homestead restoration project was initiated by Frawley Ranches, Inc. and Elkhorn Ridge Development. Additional assistance for restoration of the Frawley Ranch properties have come from the Deadwood Historic Preservation Trust. As the Tuesday tour was ending, a fast-moving thunderstorm unleashed heavy rains on the Anderson Ranch. Check out our Anderson Homestead Gallery of photos taken during the tour. Frawley later joined the annual meeting of the Spearfish Area HIstorical Society (SAHS) for its 7:30 p.m. gathering at the Spearfish Senior Citizen's Center. There, following a 20-minute video that featured Frawley recounting historical highlights of the Anderson Ranch, he shared additional insight into the restoration project and spent time answering questions from a very inquisitive audience. Frawley later indicated that there's been considerable interest in the video. Persons who'd like to obtain a copy of the James Anderson Homestead program should send an e-mail to Larry Miller. In a brief SAHS business session, Treasurer Dorothy Honadel provided the good news that membership for the organization has reached about 140, and that about half of those members are Lifetime Members. This slate of board members was elected unanimously by those in attendance. Miller thanked current board members and officers for their service to the society during the past year; these included Laurie Hayes, Mary Selbe (Secretary), Cheryl Miller, Dorothy Honadel (Treasurer), Rand Williams (Vice-President), and Callie Houghton. He also acknowledged the good efforts of Norma Landsberger in coordinating refreshments for all of the society meetings, and for the many other persons who have volunteered their time and talent in a wide range of activities -- from revising the bylaws and conducting inventories to making phone calls to remind members of meetings. Following the meeting, members and guests enjoyed treats provided by Debbie Siemonsma and Gale & David Ramberg. The society will take hiatus for the summer but will resume meetings next September. Check out our schedule of tentative 2012-13 Programs.